A receipt for a customer's payment can be printed or emailed at the time the payment is recorded in Jackrabbit. If the payment you are recording is a credit card or bank account payment (ePayment), Jackrabbit automatically sends an email receipt for approved payments. Opting to email a receipt when processing an ePayment may result in two receipts being emailed to the family (if the payment is approved). 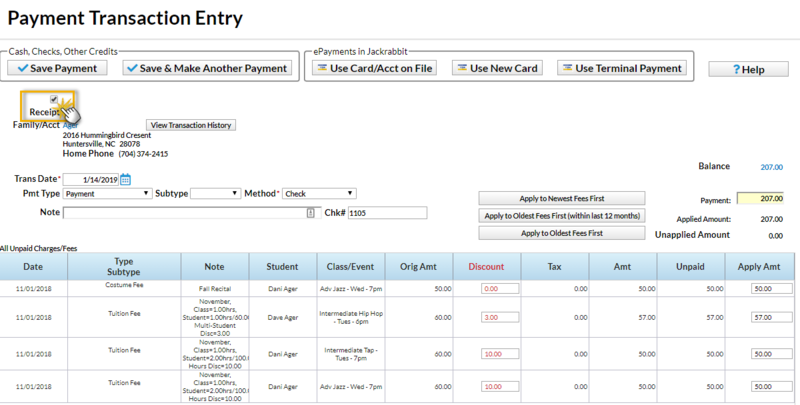 When you are entering the payment, select the Receipt checkbox in the Payment Transaction Entry window. Note: This checkbox must be selected first, before selecting one of the payment option buttons. After you select one of the buttons that complete the payment process, the receipt will display on screen.